The plant is the most important agent in crop production. Soils, cultivation, fertilizers, irrigation, and other factors, in a sense, are all more or less subsidiary. Soils are modified by cultivation, by adding manure or other fertilizers, by drainage or irrigation, and in other ways with the express purpose of changing the environment so as to stimulate plants to increased productivity. Hence, it is not surprising that from time immemorial extended observations and, later, experiments have been made upon the aerial growth of crops under varying conditions. In fact an almost bewildering array of literature has resulted.But quite the converse is true of the underground parts. The root development of vegetable crops has received relatively little attention, and indeed accurate information is rarely to be found. The roots of plants are the least known, least understood, and least appreciated part of the plant.This is undoubtedly due to the fact that they are effectually hidden from sight. Notwithstanding the extreme difficulty and tediousness of laying the roots bare for study, it is not only remarkable but also extremely unfortunate that such investigations have been so long neglected. It clearly seems that a thorough understanding of the activities of plants both aboveground and belowground and the ways in which these activities are favorably or unfavorably modified by various cultural practices should be basic for scientific crop production. Yet almost countless field experiments, selections, breeding, and testing of varieties, etc. have been carried on in all parts of the world with little or no knowledge as to the behavior of that very essential portion of the plant, the absorbing system.Similarly, in the study of soils, the greatest attention is given to the problems of the physics, chemistry, and bacteriology of this substratum and rather largely to the cultivated portion of the surface only. The soil, barring the living organisms which it supports, is perhaps the most complex, the most interesting, and the most wonderful thing in nature. Surely it should receive thorough investigation. But a study of the soil and the way in which its various relations affect yield without a consideration of the essential, intermediary absorbing system is more or less empirical.A complete, scientific understanding of the soils-crops relations cannot be attained until the mechanism by which the soil and the plant are brought into favorable relationships, i.e., the root system, is also understood. In both field and garden the part of the plant environment that lies beneath the surface of the soil is more under the control of the plant grower than is the part which lies above. He can do relatively little toward changing the composition, temperature, or humidity of the air, or the amount of light. But much may be done by proper cultivation, fertilizing, irrigating, draining, etc. to influence the structure, fertility, aeration, and temperature of the soil. Thus, a thorough understanding of the roots of plants and the ways in which they are affected by the properties of the soil in which they grow is of the utmost practical importance. Before other than an empirical answer can be given to the questions as to what are the best methods of preparing the land for any crop, the type of cultivation to be employed, the best time or method of applying fertilizers, the application and amount of water of irrigation, kind of crop rotations, and many other questions, something must be known of the character and activities of the roots that absorb water and nutrients for the plant and the position that they occupy in the soil. A spurge (Euphorbia montana) showing differences in root habit resulting from environment. The plant on the left was excavated in the Great Plains of Colorado. Maximum branching occurred in the third and fourth foot, although the taproot reached a depth of more than 7 feet. The plant on the right, with a shallower but much more finely branched root system, was excavated from a "half-gravel slide" in the Rocky Mountains of Colorado. The wide range in soil and agricultural conditions under which vegetable crops are grown renders them particularly suitable both for the investigations of their root habits and also for a study of the agricultural significance of the differences encountered. Enough work has been done to show clearly that among garden crops root adaptations frequently occur. These will be pointed out in the following chapters, although a mere beginning has been made. The field is enormously large and difficult but one rich in possibilities.It seems entirely probable that some of the best-yielding crops are able to outstrip others largely because of their greater efficiency in securing a greater and more constant supply of water and nutrients. On the other hand, the failure of a crop to thrive in a particular soil may be due to a lack of adaptation of its root system to the environment imposed upon it. Both of these conditions are illustrated by the growth of flax in India. The agriculture in many of these areas is ancient, there have been few innovations, and the soil conditions have had time to impress themselves on the varieties of crops cultivated. A condition of equilibrium between the type of plant and the soil has been obtained, as there has been ample time for the operation of natural selection. When we compare the root system of linseed from the black-soil areas with that of the varieties grown on the Gangetic alluvium, striking differences appear.The roots produced on the black soils (of the Peninsula) are deep, somewhat sparse, and are well adapted to ripen the plant quickly with the minimum of moisture. The type of gearing fits the soil. On the alluvium, where moisture is more abundant and where the aeration of the subsoil is poor, the root system is superficial but at the same time well developed. On the intermediate types of soil . . . linseed produces a type of root about halfway between that of the black soils and of the alluvium. Once more the root system is found to fit the soil type.Further when we grow side by side on the alluvium these three classes of linseed, there is little or no adaptation of the roots to the new conditions, but the three types behave very much as they would in their native habitat. The deep, sparse root system of the black soil areas is developed in the alluvium, although it is fatal to the well-being of the crop. When the experiment is reversed and the types which suit the alluvium are grown on the black soils, there is again little or no adaptation to fit the new conditions. The linseed crop consists of a large number of varieties which differ from one another in all sorts of characters, including the extent and distribution of the roots. The root systems of the varieties are just as characteristic and just as fixed as the differences in the seed and other aboveground characters of these plants. A similar state of affairs obtains in other crops like wheat . . . and the opium poppy, and is probably universal all over India. Thus the differences between the root systems of varieties have been clearly shown and the economic significance illustrated. The complex relationship of plant, soil, and climate may be further illustrated in the use of fertilizers. They modify the habit of growth as well as the composition of the plant. For example, phosphates, when applied to soil upon which wheat or certain root crops are grown, promote deeper root penetration. This results in a greater water and nutrient supply for the plant. Earlier development and ripening may be promoted or drought mitigated.Soils thus fertilized will produce crops under an environment perhaps otherwise quite unfavorable. Vegetable production should be studied from the point of view of how roots and shoots of plants grow, and use should be made of the plant itself for indicating the direction of future research. An adequate discussion of the environment of roots (the soil), how roots are built to perform their work, and root habits in relation to crop production has been so recently given in "Root Development of Field Crops" that further statement seems unnecessary. For a general discussion of the effects of irrigation, drainage, water content, aeration, temperature, nutrients, tillage practice, plant disease, and related phenomena upon root habit and their significance in crop production, the reader is referred to the same volume. In the present studies the direct method of root examination has been employed. It has been used by the writer and his coworkers in the excavation of hundred of root systems during the past 14 years and has proved very satisfactory. By the side of the plants to, be examined, a long trench is dug to a depth of about 5 feet and of convenient width. This affords an open face into which one may dig with hand pick and ice pick and thus uncover and make a careful examination of the entire root system.This apparently simple process, however, requires much practice, not a little patience, and wide experience with soil structure. In every case several plants were examined at each stage of development to insure an adequate idea of the general root habit. As the work of excavation progressed, the trench was deepened, if necessary, so that finally the soil underlying the deepest roots was removed. Frequently, the trenches reached depths of 6 to 11 feet (Fig. 2). 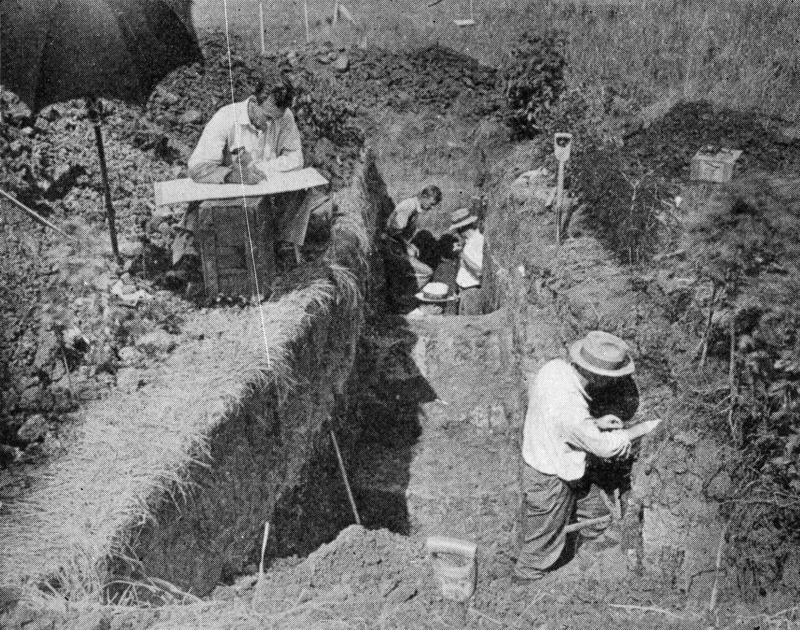 Trench used in the study of root systems. In this case 3-year-old trees were being excavated. They did not extend deeper (5 to 8 feet), however, than many vegetable crops of a single season's growth. Upon excavating the roots, detailed notes and careful measurements were made in the field. After several plants were examined, these notes were studied and any point that remained indefinite was at once clarified by further study. This method leads to a high degree of accuracy. Drawings of the root systems were made in the field on a large drawing sheet with pencil and later retraced with India ink. They were made simultaneously with the excavation of the roots and always by exact measurements.In the drawings the roots are arranged as nearly as possible in a vertical plane; that is, each root is placed in its natural position with reference to the surface of the soil and a vertical line from the base of the plant. In some cases the drawings represent the roots in their natural position in the surface foot of soil. In every case it was sought to illustrate the average condition of root development rather than the extreme.Although the drawings were made on a large scale, the rootlets were often so abundant that it was quite impossible to show the total number. 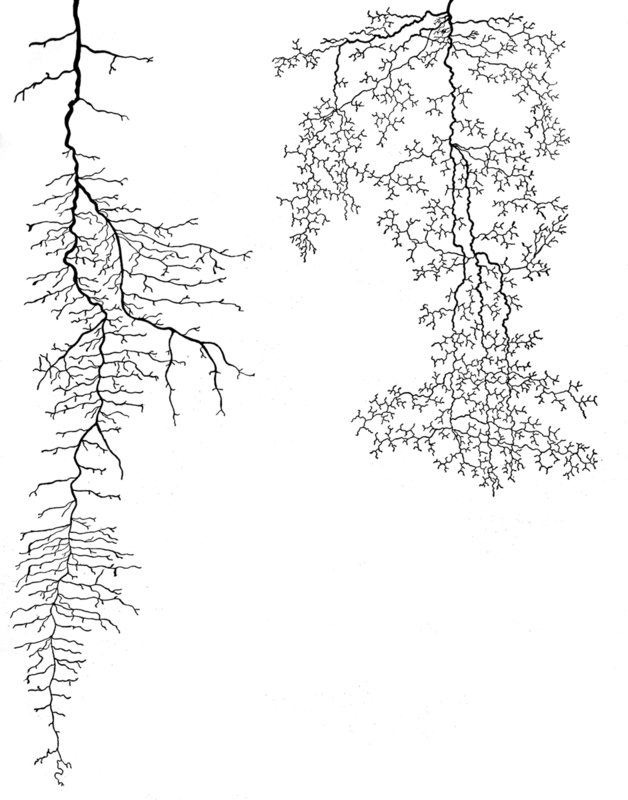 Such drawings, however, carefully executed, represent the extent, position, and minute branching of the root system even more accurately than a photograph, for under the most favorable conditions, especially with extensive root systems, the photograph is always made at the expense of detail, many of the finer branches and root ends being obscured. Since roots, like aboveground parts of plants, are greatly modified by environment, a brief statement will be given of the conditions under which the crops were grown. The vegetable crops at Lincoln were grown in a fertile, dark-brown, Carrington silt loam. Preceding them white clover had been raised for 2 years. This was followed by a crop of maize. The soil was not only in an excellent condition as regards tilth but also was well supplied with humus. In general, it may be said that the soils of eastern Nebraska have a sufficient supply of all the essential nutrients to insure good crop yields, except that, owing to the systems of cropping, there may be a deficiency in available nitrates. The area was only slightly rolling, the general slope being toward the south. As usual, some differences in soil texture were found in excavating the root systems in different parts of the area. The following description of the soil profile represents an average condition. The surface 12 to 14 inches was a mellow, very dark silt loam from which the roots were readily removed. At greater depths it intergraded into a dark-colored, clay subsoil. This became quite sticky when wet and hard when dry. It exhibited a columnar or jointed structure, especially below 18 inches, cracking badly when it shrank upon drying. Roots were removed with much more difficulty from this soil layer. At about 3 feet in depth the subsoil became much lighter yellow in color and graded rather abruptly into an easily worked, quite mellow, friable soil type approaching loess in many of its physical properties. This extended beyond the depth of greatest root penetration, i.e., over 12 feet. It was characterized by rusty streaks and numerous small calcareous areas and concretions. Earthworm burrows penetrated the soil to depths of 8 feet or more and numerous old-root channels extended almost as deeply. In many places extensive surface cracks reached depths of 4 to 5 feet. They were sometimes 1 inch in width. These crevices had been formed during past years of drought and were filled with rich, black, surface soil which had been washed or blown into them. Cultural operations in a large measure had also undoubtedly contributed to the filling. Mechanical analyses of the soil at the several depths to 5 feet, together with the hygroscopic coefficients are given in Table 1. The fine texture of the soil is reflected in the rather high hygroscopic coefficients at the several depths. This, of course, denotes also a high water-holding capacity. The crops, in nearly all cases, were grown in triplicate plats so that early, midsummer, and later examinations could be made without disturbing the areas in which the plants were to make further growth. The plats, although somewhat variable in size, were in all cases large enough to permit of normal field development, each group of plants being entirely surrounded by plants of its kind. For example, the plats of lettuce, radishes, and onions were 12 feet long and 10 feet wide, the plants in the central portion of each plat being used for a single root study. In the case of the tomato, cabbage, eggplant, and other crops where each plant occupied considerable space, the plats were proportionately larger so that the plants examined were grown under the ordinary competitive conditions and mutual environment of garden crops. The field was plowed 8 inches deep early in the spring after all cornstalks, stubble, and dried weeds had been carefully removed. This was followed by repeated harrowing until an excellent, firmly compacted, moist seed bed of good soil structure was formed. On areas not immediately planted, weeds were removed by raking and hoeing. After the seeds were sown or the seedlings transplanted, further cultivation was done very shallowly with rake or hoe so as not to disturb the roots. Cultivation and weeding were repeated, as in ordinary gardening, when needed to prevent the growth of weeds and to keep the surface soil in a good condition of tilth. At no time did cultivation extend to greater depths than 1 inch. The rainfall of 19.2 inches during the 6 months of the growing season was 2.3 inches below the normal, with periods of moderate drought occurring in May and again in July. April with a deficiency of 1.2 inches had three well-distributed showers. In May efficient rains occurred on the eighth and fifteenth, with a monthly deficiency of 3 inches. June was a wet month with a total of 6.6 inches of precipitation, mostly in seven well-distributed rains. This was 2.3 inches above the mean. July had four rains during the latter half of the month and a total precipitation 1.8 inches below the mean. Five well-distributed showers fell in August, an excess of 1.2 over the mean. September had only 0.2 inch above normal, the rains also being well distributed. As a whole the growing season was typical for eastern Nebraska. The spring was cool, frost occurring until about May 12. The loss of water through transpiration is directly controlled in a large measure by the amount of moisture already in the air. This is also an important factor governing the evaporation of water directly from the surface soil. Consequently, a record of relative humidity was obtained by means of a hygrograph appropriately sheltered with the recording apparatus about 5 inches above the soil surface. Table 4 gives the average day humidity (6 a.m. to 6 p.m., inclusive) and the average daily humidity (24 hours) for the several weeks from May 13 to Aug. 25. The rather low relative humidities promoted high rates of transpiration, which in turn undoubtedly stimulated an active growth of roots. Evaporation was measured by Livingston's standardized, non-absorbing, white, cylindrical atmometers. These were placed in a bare area in the field with the evaporating surface at a height of 2 to 4 inches above the surface of the soil. Table 5 gives the average daily evaporation by weeks from Apr. 16 to Aug. 29. These data clearly show that during the last half of May and periods in June and July the evaporation was quite high. 23 CANNON, W. A. Experimental studies on roots. Carnegie Inst. Wash., Year Book, 24: 289--298. 1925. 60 HOWARD, A., Director, Institute of Plant Industry, Indore, Central India. Correspondence. 1926. 86 KRAUS, C. Untersuchungen fiber die Bewurzelung der Kulturpflanzen in physiologischer und kultureller Beziehung. Forschungen auf dem Gebiete der Agrikultur-Physik, 18: 113-166 1895. 87 Ibid. 19: 80-129. 1896. 131 SAHUT, F. De Finfluence directe du sujec; sur le greffon. Rev. Hort., 57: 305-309. 1885. 160 Toumey, J., W. Initial root habit in American trees and its bearing on regeneration. Address at the Fourth International Botanical Congress at Cornell University, Ithaca, N. Y., Aug. 17, 1926. Unpublished. 165 VOROB'EV, S. I. On the study of the root systems of cereals and forage plants. Selsk. Khoz. Liesov., 251: 477. 1916.